The 600 HEPA Series (600 CFM): The FIRST Whole-House HEPA Filtration System…And The Last System You’ll Ever Need. This home air purifiers and home air cleaners series includes the 600 Hepa Shield, the first whole-house certified HEPA filtration system. By utilizing the efficiency of HEPA filters, the 600H and 600HS have adopted the same filtration effectiveness as required in hospital surgery rooms, clean rooms, and other applications where the removal of harmful respirable particles (less than 1 micron in size) are necessary. 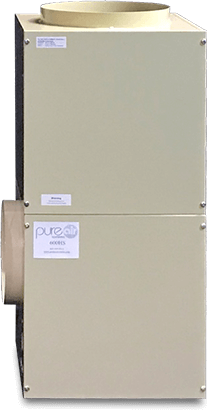 In 1985 Pure Air Systems was the first company to introduce a whole-house certified commercial grade TRUE HEPA filtration system. 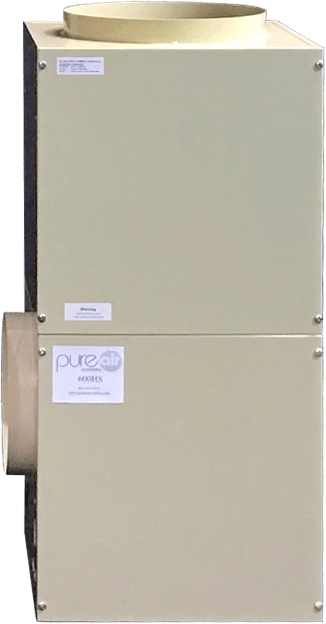 Today, Pure Air Systems offer a full line of HEPA based air filtration and air purification systems for the residential, commercial, institutional, industrial and medial markets, fabricated from the highest quality components and all made in the USA. The 600HS can be ordered with the standard single speed 1/3 HP induction motor or in the PLUS version using the GE (Genteq) ECM variable speed 120/240 volt, 50/60 Hz energy efficient 1/3 HP motor. The ECM motors can use 40% – 50% less energy to operate than the standard induction motors. The 600HS unit provides over 600 CFM of HEPA filtered air. 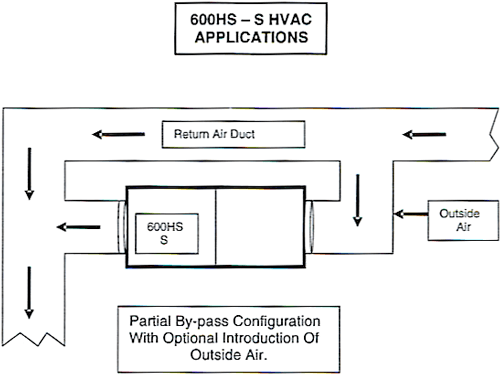 The 600HS unit was designed to be used either attached to any forced air ducted heating/cooling system in the partial by-pass configuration or used as a stand alone unit. For attachment to a ducted heating/cooling system typically the “L” version of the 600HS unit is used. The “S” unit, or straight through unit, can also be used for attachment to HVAC units when the “L” version is not suitable. 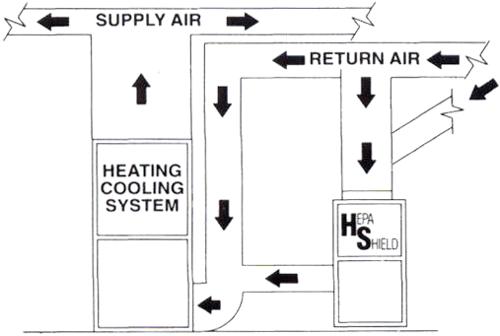 Either the “L” or “S” versions can be used as stand-alone systems when not using an HVAC unit. The “L” or vertical housing allows for left or right hand installation and the “S” or horizontal unit allows for ceiling mount or attic installations. If the 600HS unit is used attached to an HVAC unit either a sail switch or pressure switch can be used to operate the 600HS in conjunction with the heating/cooling thermostat. For all other applications the on/off switch can be used. 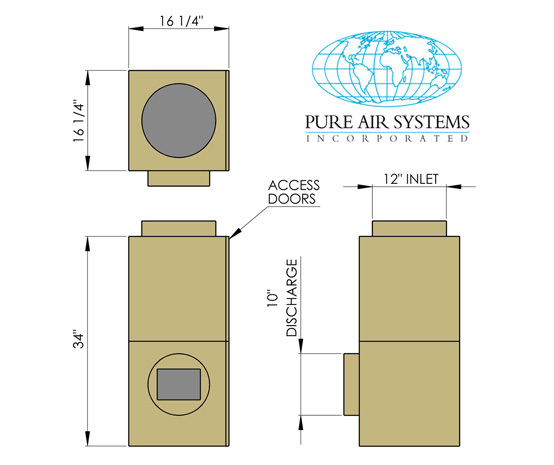 Pure Air Systems offers two different controller options for the PLUS series. 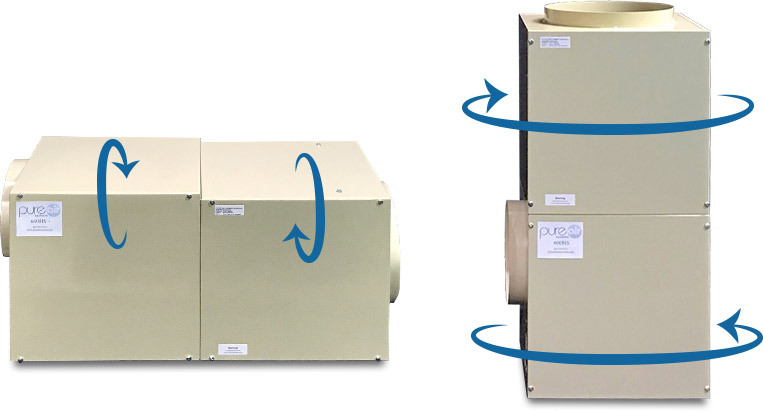 Couple the ECM motor with our HVAC controller and the system fan will modulate (speed up and ramp down) in conjunction with most heating/cooling systems. For applications where more flexibility in HEPA filtered air volume control is required or you want to run the system independently you can use the VCU controller. The digital VCU controller allows for air flow speed control from 1 to 100% of volume in 1% increments. The 600HS “L” and “S” series units are manufactured using a unique split housing design where the blower/motor section and filter section are separate but symmetrical. This allows the top and bottom sections to be rotated in any of four positions to allow for best inlet or discharge configurations. This also allows for best access to the filter section via the filter access door. 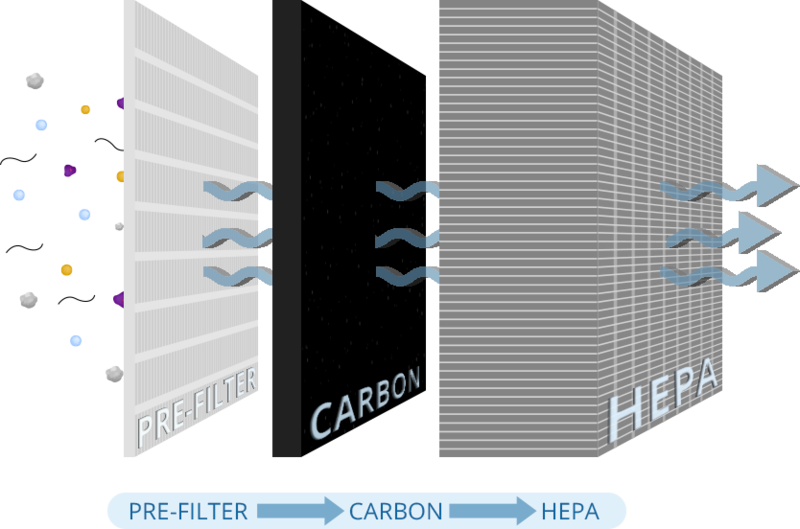 The 600HS, like all of our systems, use a three – stage filtration process. Each unit includes a commercial grade dual-layer polyester ring panel filter that is used to remove the larger particles and protect the carbon and HEPA filters. A 5lb pad of carbon media is included for removal of gases and odors. The final filter is a True, commercial grade, certified 99.99% at 0.3 microns metal framed HEPA filter. 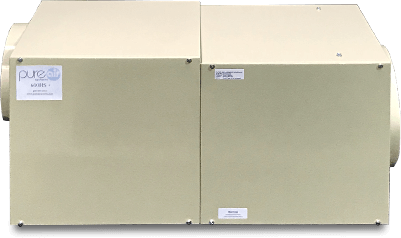 For applications where the issue is primarily odors and/or specific gas reduction or removal we can configure the 600HS with all carbon media in- lieu of the HEPA. This allows us to have up to 20lbs of carbon media for severe odor and gas problems. The 600HS unit is designed to attach to any forced air ducted heating/cooling system in what we call the partial by-pass configuration. This allows us to attach the 600HS unit to any size HVAC system up to 5 ton capacity and provide very efficient, very effective filtration. This also means there is no additional static load placed on the HVAC fan and even in the by-pass configuration the 600HS will provide up to 48 air changes in 24 hours in most homes. The schematic below shows a typical by-pass configuration for the 600HS. The 600HS can also be used in townhomes, apartments, condominiums, villas, and small offices. 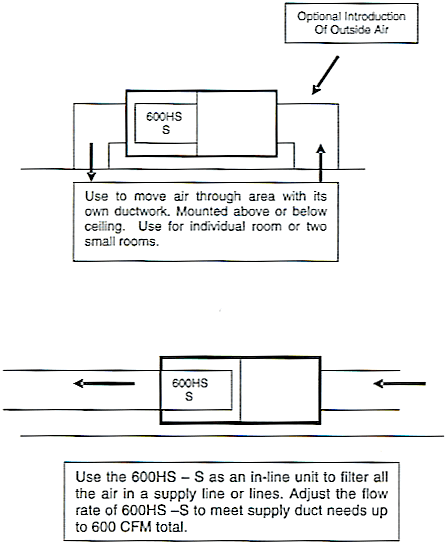 In situations where there is no forced air ducted HVAC unit the 600HS units can be used as a stand alone system where you can run ductwork to them and from them and use them as an independent filtration/air moving system. Typically the 600HS could be used in this configuration for an occupied area ranging from 400 sq. ft to 1200 sq. ft. You can use either the “L” or “S” version. 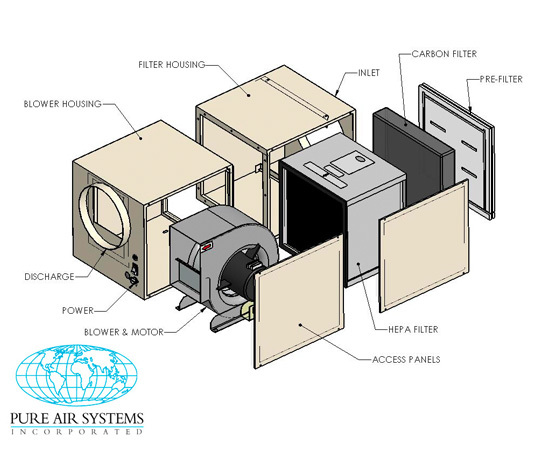 Whether the 600HS unit is installed in the by-pass or stand-alone configuration outside air can be introduced into the occupied space through the unit. This allows for the introduction of filtered, outside air and can assist in pressurizing the occupied space eliminating the possibility of outside airborne contaminants from entering the inside space. The 600HS Plus “L” Model can be attached to any heating/cooling system, 3 tons or larger. 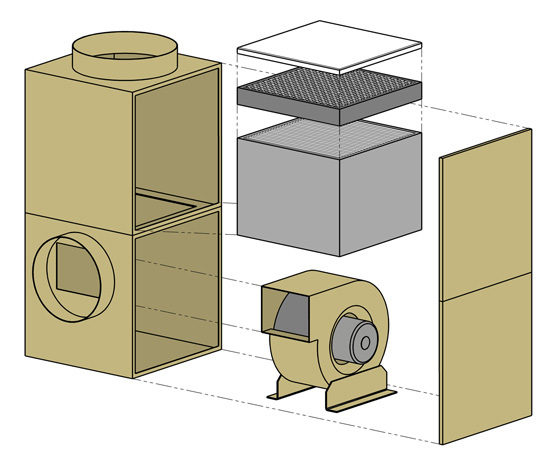 The split housing design allows for left or right hand installation. It can be used with up-flow, down-flow, attic or crawl space system and even in a stand-alone configuration. Can be mounted horizontally or vertically. You can introduce, outside filtered fresh air through the 600HS Plus unit.